With the A-Chair, designers jehs+laub have created a chair for large venues and events for Brunner, which appears all of a piece, thanks to the smooth junction of seat shell and frame. 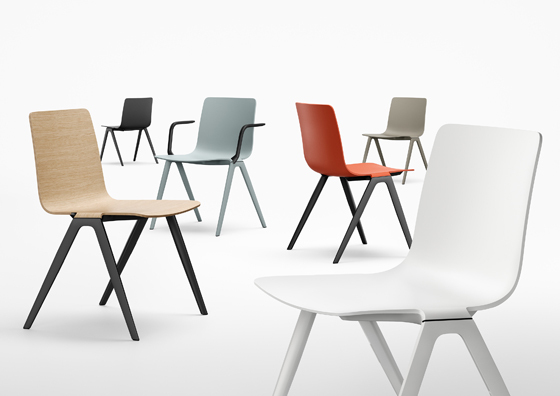 As a modular all-purpose chair, it sets new benchmarks in terms of design, material and handling. 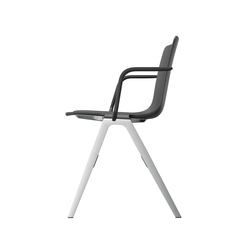 When they started their design for the A-Chair, designers Markus Jehs and Jürgen Laub wanted to create a row-linking chair with lines as simple and harmonious as in a monobloc chair, without compromising functionality and seating comfort. Starting off with a first idea sketched on a folded piece of paper, they paid great attention to keeping the clarity and flow of the original lines throughout the entire development process. The result: a piece of furniture with a sculptural air – seen from the side, its silhouette is like a capital letter A, hence its name. In professional event organisation, the product innovation A-Chair easily fulfils all requirements, and is equally convincing in its characteristic, timeless design and its high seating comfort. 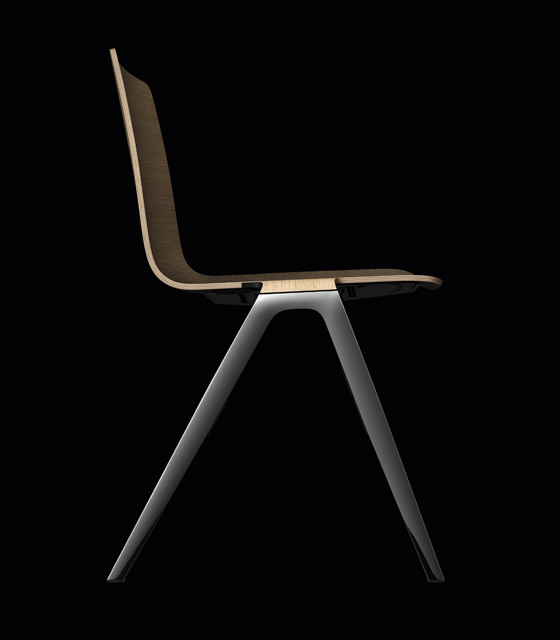 Its smooth and all but invisible junction of seat shell and frame lends this Brunner chair a harmonious appearance. The functional separation of rigid, high-tensile frame and elastic, comfortable seating shell turns this chair into a comfortable all-purpose chair with numerous versions for many areas of deployment. 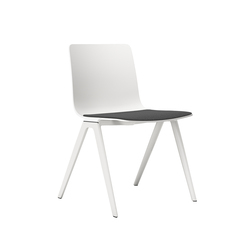 The perfect ergonomics of the plastic or shaped plywood seat shells assure relaxed seating, regardless of finish or version. Optional armrests and seat liners provide additional seating comfort. 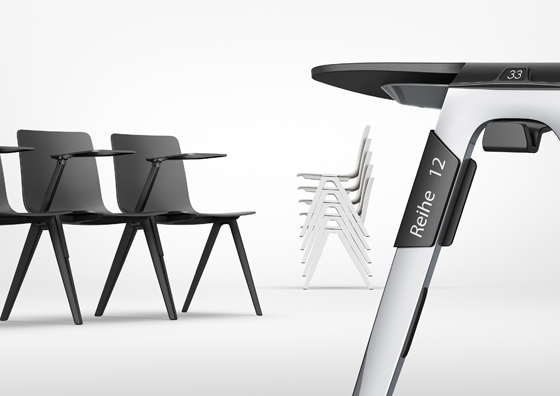 They, too, seamless blend into the chair’s design and are suitable for frame-linking the A-Chair in rows for events, without using up additional space. 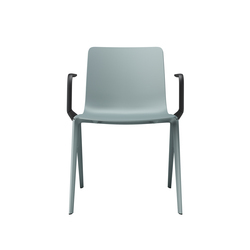 The A-Chair frames are either made of die-cast aluminium or high-tensile plastic. For the plastic frame, a polyamide with optimized surface and high glass fibre content was developed in collaboration with BASF; this material excels with high tensile strength and transverse rigidity, presenting a true alternative to traditional materials like aluminium or steel tubes. Material, colours and fabrics may be combined in many ways for realising many different individual interior design options: from puristic and monochrome plastic all the way to noble looks with a polished die-cast aluminium frame equipped with a stained oak plywood shell featuring a leather through liner as upholstery. 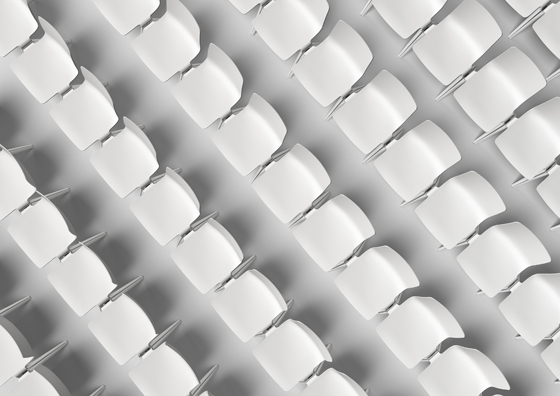 When placed in rows, the A-Chair really comes into its own. Here, any two adjacent legs visually combine into a single entity, calming the entire room with their impression of discrete elegance. 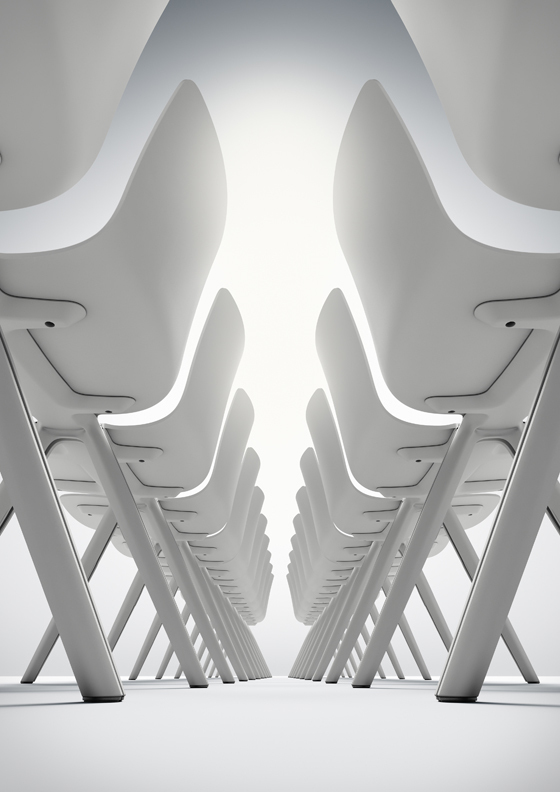 Further product benefits like space saving vertical stacking complete the A-Chair’s list of positives. 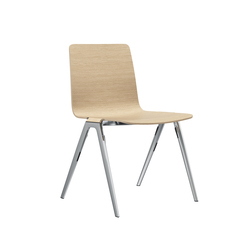 Up to 15 chairs with or without armrests can be stacked on top of each other without any problem – with stacking buffers taking good care of protecting the aluminium frames and plywood shells. Add convincing features like left or right clip-attachable plastic row numbers, or easily readable, pilfer proof, magnetic seat numbers integrated into the lateral stacking buffer – in case of chairs with armrests, these are additionally set in the armrest. Moreover, the plastic versions in particular are easy to clean, offering low-maintenance handling. The A-Chair has been awarded the GS sign as proof of passing the safety requirements of an increased number of dynamic overturning tests. 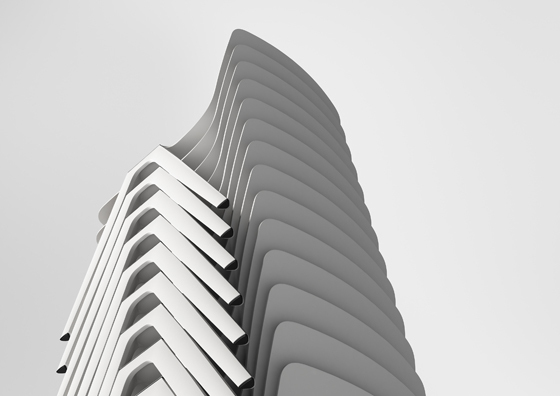 Its materials can be separated as mono-fractions and recycled accordingly. 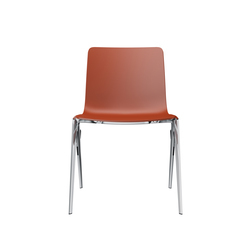 In a nutshell: the A-chair is an unrivalled chair for events and large venues.